Our aim is to create a collaborative reproduction of Stubbs’ Dingo, in a gilded frame, and we need you to help! Helen Robertson, Organic Conservator explains why. The Royal Museums Greenwich Conservation Department, in partnership with Travellers’ Tails, have started a series of drop in gilding and art workshops at our pop-up space in Lewisham Shopping Centre. 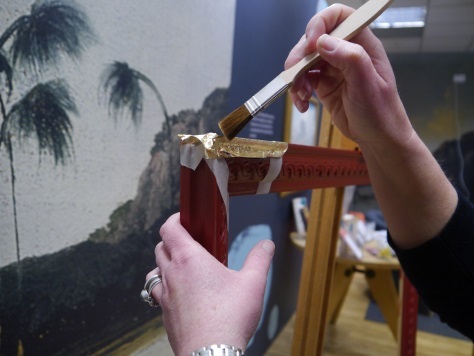 We have fun activities, for kids and adults, to try gilding or wax painting. These techniques were used by Stubbs in his paintings of the Dingo and Kangaroo which are being celebrated, along with Captain Cook’s voyagers of discovery, by the Travellers’ Tails project. 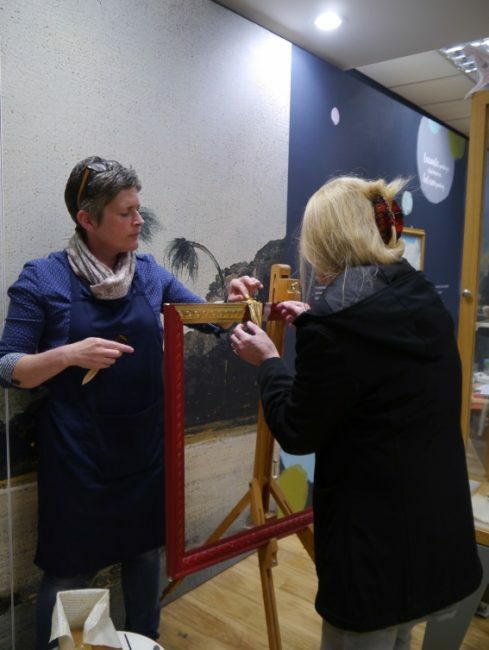 We’ve already made a start and those who gave gilding a try for the first time loved the experience. 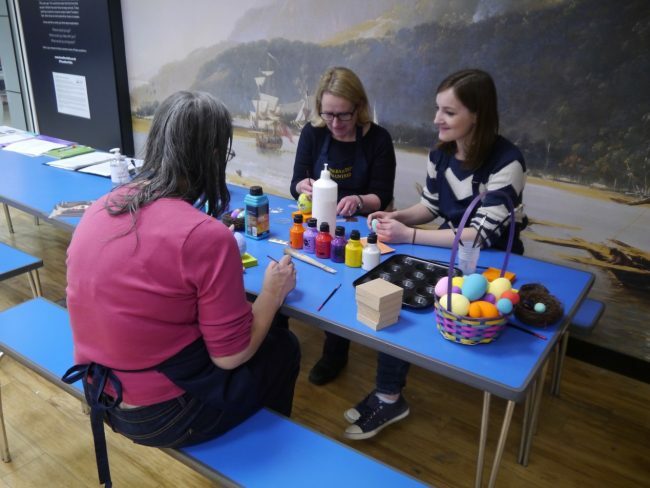 Feedback included ‘confidence building’; ‘therapeutic’ and ‘a special experience’ so why not come along and try something different for the first time yourself? If you don’t have much time, then ten mins is all it takes, although the conservation team are on hand to offer further advice and guidance if you want to learn more. Our favourite of the day was a lovely lady, just passing by, who, for some time, has wanted to gild an old tiled washstand but didn’t quite have the confidence to take the plunge. She does now! Further gilding workshops will be held on the 4th, 18th and 25th April or you can help paint the Dingo on the 7th, 21st and 28th April. They’re free so drop in, between 10 – 3, and try something a little different.